Root: coralloid, branching. Stems: glabrous, clothed with closely sheathing scales. Flowers: in long racemes on short minutely bracted pedicels; sepals and petals narrow, lip short; spur a sac adnate to the summit of the ovary. Fruit: capsule oblong. A plant impossible to mistake, for its roots are exactly like branches of coral, composed of thick, white, blunt fibres, and may be found in moist shady places. The flowers grow in a raceme on single, thick, fleshy stems, that are clothed with closely sheathed bracts and are of a queer purplish-green colour, frequently marked with white. It has no leaves. The Coral Root is a saprophyte; that is to say, it lives upon the dead and decomposing forms of other plants, and this explains why it is such a vegetable degenerate of the beautiful family of orchids. It has lost its leaves, also its chlorophyll, or honest green colouring matter, through its bad habits, and to-day belongs to that pirate tribe which feeds upon food already assimilated by another, and thereby incurs the displeasure of Nature, whose laws demand honest conduct in her kingdom as sternly as do those of man; and so, when the Coral Root refused to manufacture its own upbuilding materials out of the carbon dioxide of the atmosphere, and proceeded to prey upon decaying matter, Nature took away its leaves and chlorophyll and only left it sufficient branching extensions at the base to secure it in the soil. 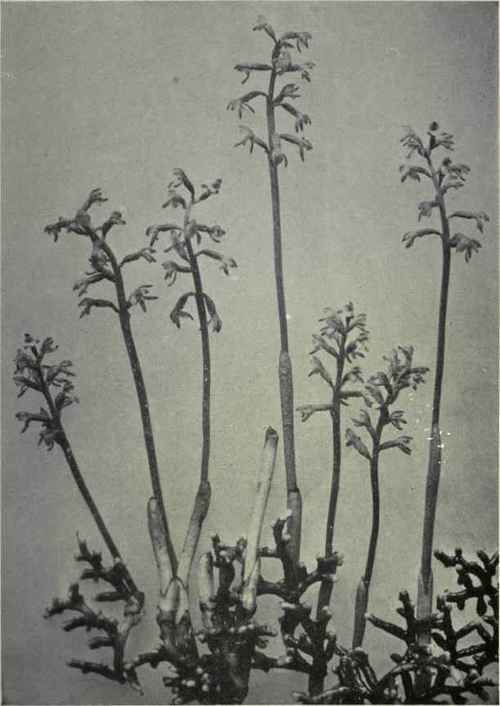 Corallorhiza macnlata, or Large Coral Root, grows as high as twenty inches and has purplish-green flower-stalks clothed with scales. The numerous flowers are purplish-brown, and the lip white-spotted and lined with purple, the middle lobe being broader than the lateral ones and the apex curved. The spur is yellowish. Corallorhisa striata, or Striped Coral Root, has dark purplish-brown flowers with elliptic petals, an oval lip, and no spur. Corallorhiza Mertensiana, or Spurred Coral Root, has numerous reddish-green flowers, usually a toothed lip narrowed to a claw and a very marked spur.